AP Services, a product and service brand of Curtiss-Wright, has state-of-the-art gasket manufacturing technology using CNC driven water jet cutters. 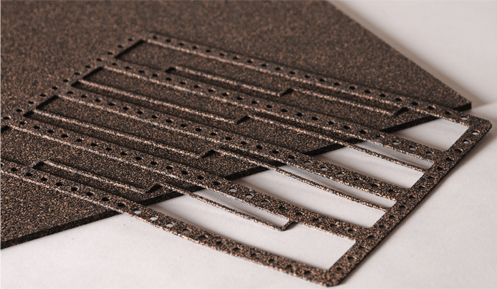 Style 439 is a composition cork and vegetable fiber glue-glycerin impregnated gasket sheet. 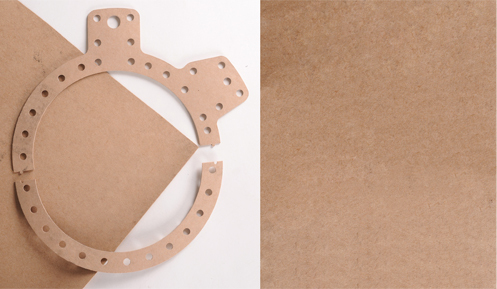 This gasket material consists of a special base fiber containing 40% granulated cork particles by volume. Style 439 is saturated with a glue-glycerin-formaldehyde impregnate which makes the sheet impervious to oil, water, and gasoline. 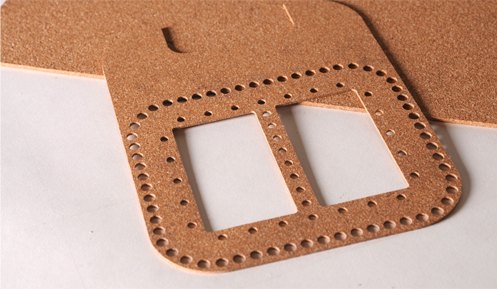 The combination of cork and vegetable fiber makes this an excellent gasket material for low-pressure applications. 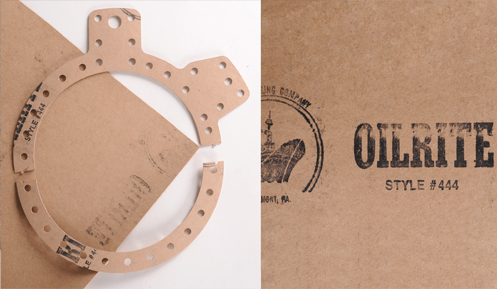 Style 439 is available in bulk sheet or precut gaskets. AP Services, a product and service brand of Curtiss-Wright, has state-of-the-art gasket manufacturing technology using CNC driven water jet cutters. Style 440 is a combination of medium size cork particles and glue glycerin. It is an excellent medium compression composition cork that is fungus resistant. Cork works well on oils and gasoline, and is good for gaskets requiring low to medium torque loads such as fluid seals, gear boxes, oil seals, and valve covers. Style 440 is available in sheets, bulk rolls (special order), and pre-cut gaskets. AP Services, a product and service brand of Curtiss-Wright, has state-of-the-art gasket manufacturing technology using CNC driven water jet cutters. Style 441 is manufactured from a blend of fine cork particles and neoprene, forming a smooth and compressible sheet. It has high tensile and tear resistance, and low compression set. Style 441 will take medium bolting pressure, has excellent heat resistance, and moderate swelling in oils and fuels. Cork & Neoprene sheet works well on oils, gasoline, Freon, and most solvents. Style 441 is good for gaskets requiring low to medium torque loads such as fluid seals, gear boxes, oil seals, and valve covers. Style 441 is available in sheets, bulk rolls (special order), and pre-cut gaskets. Thickness 1/32”, 1/16”, 3/32”, 1/8”, 5/32”, 3/16”, 1/4”,5/16”, 3/8”, 1/2"
AP Services, a product and service brand of Curtiss-Wright, has state-of-the-art gasket manufacturing technology using CNC driven water jet cutters. Style 444 Oilrite is a superior grade of vegetable fiber sheet manufactured from a combination of plant fibers and chemical additive. Oilrite effectively resists the solvent action of petroleum products. It remains tough and durable through a long service life but is pliable and compressible for secure installation. Style 444 is a resilient material for light bolt loading applications, and is recommended for oil, gasoline and most solvents. Style 444 is available in sheets, bulk rolls, and pre-cut gaskets.